The largest of the Japanese Spitz-type breeds, the Akita, pronounced a-KEE-ta, is a powerful, solid, well-proportioned and distinctive looking dog. Strong and muscular with a flat, heavy head and strong, short muzzle. 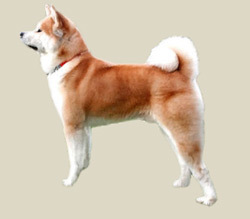 The Akita is slightly longer than he is tall with a broad, deep chest and level back. The head is broad and shaped like a blunt triangle. The stop is well-defined and there is a shallow groove going up the center of the forehead. The small, erect ears are carried forward and in line with the neck. The small, triangular eyes are dark brown. The nose is generally black brown is permitted on white Akita"s, but black is preferred,; the lips are black and the tongue is pink. The teeth should meet in a scissors, or level bite scissors is preferred by most breeders,. The tail is carried high and curled over the back. The Akita has webbed, cat-like feet - which makes it a fine swimmer. The double coat is composed of a harsh, waterproof outer coat insulated with a thick, soft undercoat. Coat colors are pure white, red, sesame and brindle. The colors should be without clear borders. A black mask is forbidden. As befitting its spitz-like heritage, the Akita is bold, independent, stubborn and tenacious. Demonstrative to its family, it is utterly devoted and will protect family members. It is reserved with strangers and can be aggressive toward other dogs. It can be domineering. Though not the breed for everyone, in the right hands the Akita is an excellent companion. The Akita appreciates mental and physical exercise every day. It needs the chance to run in a safe area or on leash for a long jog. Given ample exercise and training, it can be a quiet and well-mannered house dog. The Akita is able to live outdoors in temperate or cool climates, but it is happiest if it can spend most of its time with its family. The coat needs brushing about once a week to remove dead hair, more often when shedding. Akitas tend to be somewhat messy drinkers!